I have recently made a habit of asking this question at opportune moments in classes and public lectures. Hilarious bewilderment usually ensues. Younger people shrug, while older people often get angry because of corrupt senators. I am increasingly convinced that this has become an esoteric question in our modern society. Political scientists for example, would probably answer with some notion of the social contract – the idea that we accept certain limitations on our freedom (to obey laws, to pay taxes) in return for protection and services that only a centralized sovereign government can provide. When I ask the follow-up question “why do you pay taxes?” people generally respond along these lines, with reference to education and healthcare. “we have to get rid of those foreigners because they might backstab us during the war…and let’s take their property while we are at it…” This quote could have come from an official deporting Acadians in 1755 from Nova Scotia or an official interning Japanese-Canadians in British Columbia during the Second World War. “Global corporations seem to only be interested in their own profit and have way too much influence with the government.” This quote could have come from somebody reading about the New France Company formed in 1627 to colonize Canada, but is just as applicable to any number of companies today. “Big banks and financial elites caused the economic crisis in our country, and I am going to bring them to justice.” This could be talking points for either Louis XIV imprisoning his finance minister, Nicolas Fouquet, or Barack Obama setting up a task force to investigate JPMorgan Chase. Imagine a state that only takes about ten percent of your income through taxes in most years. The rest of the fiscal regime is based on the consumption of key commodities and luxury goods like salt, tobacco, alcohol, and precious metals. The more you consume, the more you pay. During wartime or to tackle deficit crises, a flat tax of 5% would be levied on everyone. Furthermore, no sales taxes, no hidden fuel taxes on everything, no mysterious tariffs jacking up the cost of foreign cheese by over 200%. Consumption and flat taxes are considered by some to be the best way to reform our current tax system. Now imagine that every year, instead of everybody compiling all of their receipts and working through 25 schedules to submit their individual tax return, the fiscal officials just assign a certain amount of tax to each community and then leave it to the residents to figure out who pays what. The heads of household get together and draft a tax roll that ensures that people pay according to what they can afford, and then they appoint people from amongst themselves to collect everything and drop it off at the regional fiscal office. If the economy has a bad year, the state officials might even be convinced to reduce the tax by ten to twenty per cent. This community would also assemble to discuss other matters – local infrastructure needs, local charity to help out the victims of illness or accidents, crime and other threats to local security, festivals and celebrations, etc. If necessary, the group would choose a representative to take their concerns to the local magistrate or government office. Imagine a state where if you have a dispute that cannot be resolved amongst yourselves – over money or property, threatening behaviour or bullying – you can walk into your local courthouse, register your dispute with the bailiff, be seen by a judge within two weeks, and expect the matter to be resolved within a couple of months, and all at a price that ordinary people can afford? This state would be quite different from the one with which we are familiar today. Our current chief justice has recently noted that the justice system is simply inaccessible to most Canadians, who “can’t get justice” because of costs, backlogs, and an overcomplicated system. This imaginary state was real. 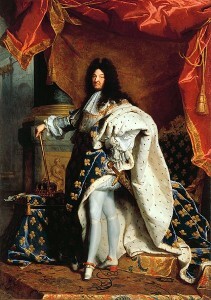 It was Louis XIV’s France – the height of absolutism. When kings were unabashedly kings and put there by God, when true manliness was defined by a well-turned calf in hose and the ability to dance or recite poetry, when slavery was accepted practice and women were considered minors, when public officials abused their powers openly because their position was something they had bought as property. Obviously, I am not arguing that we should return to this bloody and bloody-minded period of our history. I can’t dance at all. But Louis XIV’s answer to what government is for would have been very straightforward. The sovereign (in this case, the king) was the protector and chief magistrate of the realm. The sovereign defended the country from foreign invaders and preserved civil order. The sovereign made laws that regulated trade, business, and industry. The sovereign even protected the realm’s forests and waterways. The sovereign ensured that everyone had access to justice. And that was about it. Local communities largely administered themselves and the inhabitants looked after each other. How much have we really evolved since Louis XIV? In getting rid of the bad of the Old Regime, what good things have we lost? Today’s Canadian state has become so ponderous that it seems both to decide everything for us and to never be there when we need it. A modern Canadian prime minister in a majority government enjoys legislative and executive power of which Louis XIV could only have dreamed. Meanwhile, ordinary people are so disconnected from politics that we do not even know what our government is for anymore. Communities capable of administering themselves and resolving their own problems no longer exist. Instead, we expect government at all levels to solve our problems for us and cut them a cheque – over 118 billion dollars in personal income taxes alone in 2011. Our influence on government is limited to voting once every few years for somebody who we do not even know to represent our interests – a polite fiction since we know very well that he or she will vote with his or her party on any issue that matters. What is government really for? Why do we pay taxes? What do you think? Why confuse our poor little sheep-brains with thoughts about sovereignty, power, leadership, and purpose when we are so happy stuffing that gaping hole in our soul with fast food, reality television, and the latest iphone? As an historian of the early-modern period, I think we should re-evaluate what government is for because an illiterate peasant (at least, a male, Catholic, French one) at the height of Louis XIV’s absolutist regime enjoyed a lighter and more transparent tax regime, better access to justice, and more autonomy at the community level than Canadians today. Because modern liberal democracy has made us helplessly, hopelessly, horribly free. And as incapable as infants. I am just discovering that there is a dearth of Canadian Studies in our universities and I don’t understand the attitude that prevents it from happening. Has anyone explained this rationally? Shouldn’t we be ashamed or at least embarrassed and shouldn’t scholars be up in arms about this? I’m almost ready to give the PM a star for renaming the CMC to CMH, or would be if I didn’t know some of what he was planning to put there.